Okay, so here's the truth: I've never read much Poe. Do I own the complete works? You bet I do. Have I ever cracked it open? Nope. But the public school system didn't completely fail me. I read The Tell-Tale Heart... about a million years ago. What I'm getting at is I didn't know much about Edgar Allan Poe's actual works going into this. Still, I think I get the gist of it and even without that, have you seen the cover?? I knew I had to read this Poe retelling! Nevermore begins as your classic goth guy meets good girl unlikely romance story. Isobel and Varen are paired up randomly for an English project and neither of them seems very happy about the prospect of working together outside of school. Obviously, they slowly begin to find out more about each other and realize that they're more than their stereotypes (no shocker there). What was kind of a shocker was how incredible this book turned out to be! Isobel is a cheerleader, thus making her the kind of YA character I wasn't sure I could tolerate. Imagine my surprise when I actually ended up kind of *gasp* liking her. Isobel does initially come off as an annoying, full of herself cheerleader. You remember the ones from high school, don't you? At the beginning of the book she totally fits every stereotype you might imagine but as events progress, it becomes clear that she's really down to earth, despite the group of mean girls (and guys) she spends her time with. Then there was Varen... Varen Nethers is the dark, tortured guy who sits in the back of the classroom wearing all black clothes, chains, and eyeliner. He carries a black journal that he writes mysteriously in, never talks to anyone outside of his own crew, and drives a 1967 black Cougar. I mean, come on. What girl WOULDN'T at least admire that guy from afar? I know I definitely would have when I was in high school. Not only is Varen super mysterious and kind of gorgeous, he's also obsessed with the works of Edgar Allan Poe. Perhaps a little too much. I loved, loved, LOVED watching Isobel and Varen learn more about each other. I loved seeing Isobel becoming more comfortable around Varen and in his world, despite the looks and gossip from the snotty high school kids around them. One of the things I cannot stand in a lot of YA fiction is the insta-love relationships that just don't make sense. The relationship between Isobel and Varen was slow and immensely satisfying, but also torturous by the end! Not knowing a whole lot about Poe's works going into this book, I feel like I was able to follow along without getting lost and actually ended up learning quite a bit. Nevermore combines several of Poe's stories with an entirely original plot. Varen has (accidentally?) created a link to a dream world that is somehow connected to Poe's stories and, as Isobel becomes more involved and enamored with Varen, she finds herself pulled in as well. The writing was beautiful and descriptive and pulled me through this book at an alarming pace. Every single time I picked Nevermore up I was shocked at how much I was sucked into reading. The dream world Kelly Creagh created for Nevermore was incredibly well done. I felt like I was watching the events happen on a screen and, for me, that is a sign of an amazing book. I felt myself becoming totally unnerved by everything in the dream world and everything that seeped out of it. The horror here is definitely more of an uncomfortable creepy than jump scares. Nevermore does have a cliffhanger of an ending - you've been warned. This is definitely a binge-read series for me! I've already picked up a copy of Enshadowed from the library and purchased the last two books from Book Outlet. 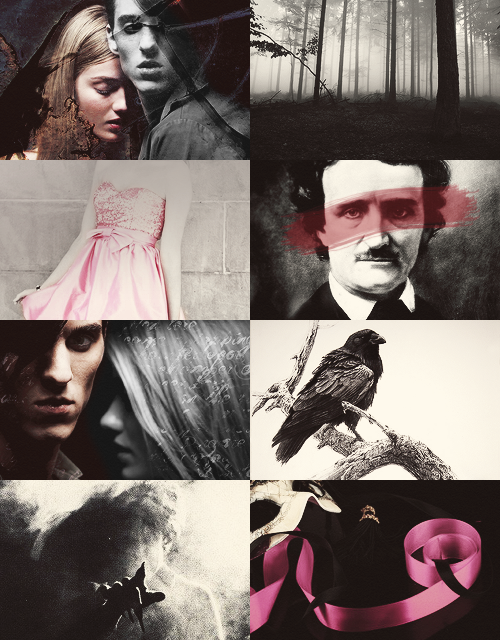 I definitely recommend Nevermore if you're looking for a creepy YA horror/romance and are a fan of Poe (or even if you don't know much about him).